Start at the location you want to fish, at the bank, or anywhere in between. Have the bait you need in your inventory (the script stops when runs out of bait). 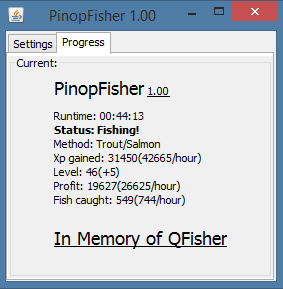 If you want to use the action bar when powerfishing or when dropping tunas, put the fish in a slot on the actionbar. If you closed your gui its ok! Go Edit -> Options -> Show GUI and everything is gonna ok. The script can be found in here. 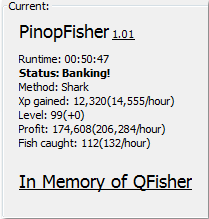 1.01 - Fixed sharks bug at Fishing Guild. 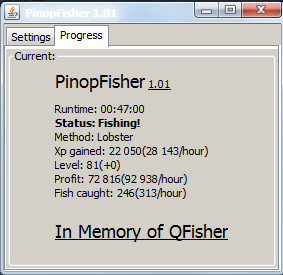 1.02 - Fixed Barbarian Fishing. 1.03 - Fixed dropping issues. Nice script, glitchy though. Fishes Tuna / Swordfish instead of Sharks at Fishing Guild. Whats the diference beetween shark spots and swordfish/tuna sports? Are those the same Id? Need more people to test! many many times this question appears. 1. did you setup the ability bar if you use it? Select the fish you wanna catch. Put the fish in a slot on the actionbar, any slot is good, as long it has a key binded to it. 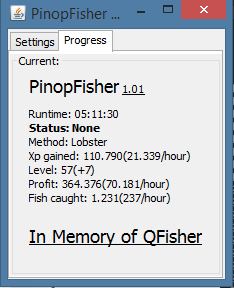 does abilit bar work only with powerfishjng?